These production awards for Machinarium are starting to feel like a broken record, aren’t they? But this one sure doesn’t sound like one! This award provided some of the fiercest competition of all, but any soundtrack that warrants its own standalone music release must be something special. Sure enough, Tomas Dvorak’s soundtrack for Machinarium made the game sound every bit as great as it looks. 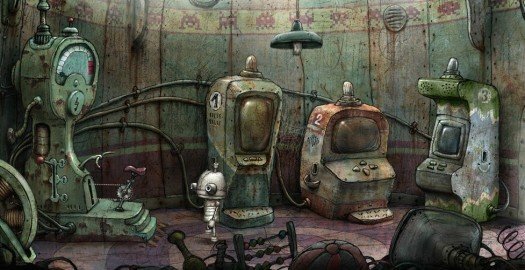 The music’s greatest achievement is the way it intuitively captures the feel of Machinarium’s distinctive style. The game itself melds grimy, industrial, almost post-apocalyptic scenery with lovable, anthropomorphic robots – think WALL-E through a surrealist filter. It makes sense, then, that the music is an eclectic hybrid as well: a relaxing mélange of minimalist electronic, glitch-pop, ambient, and even the odd bit of folk. It’s a loving compromise between airy charm and foreboding, mechanical electronic that is refreshing, unique, and the perfect accompaniment for the game’s robot hijinx. For Tales of Monkey Island, the talents of John Marsden and some random guy off the street named Michael Land were brought in to helm the accompaniment. (Okay, so Land composed the music for many enduring LucasArts classics, but other than those.) Not surprisingly, the pair created a splendidly jaunty soundtrack that fit the whimsical settings perfectly and earned it the readers’ choice award. We’d argue harder for our staff selection, but we’ve got that darned MI theme song stuck in our heads now. Thanks a lot. Next up: Best Voice Acting... the envelope, please! interesting winners. 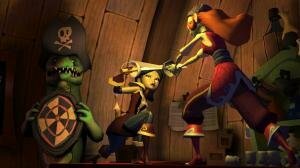 monkey island seems to be sweeping the awards so far. to me the clear winner was clearly “the book of unwritten tales”, so once its released in english speaking territories, i can already guess the winners for 2010 . then again jane jensen may have to say something about that. we’ll see. Great to see Machinarium and Blackwell in there! Really honing the best of adventure games. Holy crispy crap. I didn’t expect this! Thanks to the staff and the voters! It’s really flattering. Tales of Monkey Island Best Story? Hmmm… I don’t think it holds up that well, especially considering the incredibly convoluted role of Elaine in the plot. I agree with Best Writing, though. I think Emerald City Confidential had a terrific and engaging story. Next year I think Daedalic will win the best Graphic design award. The screenshots of The whispered world amazed me even more than the screens for machinarium, when I first saw them. @Didus: I agree that The Tales of Monkey Island shouldn’t have gotten the Best Story-award. It just didn’t feel cohesive at certain times. Also other things bothered me with the story, that I know other telltale games has suffered of, mainly the recycling of characters across episodes. Many of the characters appear in almost every episode, where the original MI games had new characters for each island. Otherwise, I think it’s great. I think “Tales of Monkey Island” was the best adventure game in 2009 and it was fair that it was given so many awards. I disagree profoundly on giving any award whatsoever to The Secret of Monkey Island: Special Edition, especially “Best Port/Updated Re-release”. The update is less nuanced, less adult, less funny, and less well done graphically. Many of the jokes fall flat when spoken out loud, the backgrounds often feel unfinished, and the ambiance is changed for the worse. The magic is gone. Amen, oerhart. Monkey Island Special Edition is an amateurish, visually cheap ‘update’ of a game that at its time (and heck, even now) had remarkable state of the art graphics, and a dark, mysterious adventure-book aesthetic to complement the strange humor. Special Edition doesn’t deserve any rewards. It deserved to be forgotten. And I certainly hope they keep their grimy hands off of the even more artistically successful Monkey Island 2. For the record, the SOMI: Special Edition is not just the “new” version, it’s BOTH versions seamlessly tied together. Those treating it like only the updated version itself are missing the point of why it won the award. I was sorry to see Time Gentlemen, Please! miss out on any awards (particularly Best Writing: Comedy and Best Indie), since to my mind it’s not just one of the best indie titles in years, but one of the best adventure games in a decade, full stop. Though clearly Machinarium gave it tough competition, and it’s hard to stand up to the Monkey Island steamroller. Totally agree on the point that the jokes in The Secret of Monkey Island: Special Edition fall flat when spoken out loud. I would switch to the scene to see what they’d done with the visual, then get right back to the classic view. Not that I am against games being remade, QFG II is a testament to that. And don’t get me started on the interface! Did you try playing on on the 360? I’d rather slam my hands in a drawer! I do love sitting on a couch playing a classic old adventure game on my tv though, port more and I’ll buy em. @ RockNFknRoll: With Best Gameplay we were awarding much, much more than hybrid controls, which many people actually liked anyway. You can of course dislike them, but - as our award description reads - gameplay is more about “Good pacing, rich exploration, and variety of activities [...] all factors in player enjoyment as well, all suitably integrated into the storyline” than simply controls. I am quite sad at the unconditional Telltale praise. If ToMI didn’t have the MI license, I’m pretty sure reviewers wouldn’t be so overlooking the *many* flaws. Or is it the lack of proper competition?